It's that time of the week again! 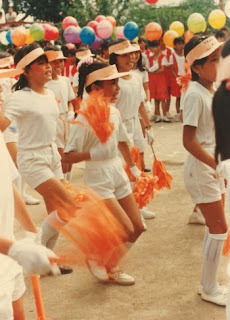 Another tale to share...and this time I'm looking many many years back...during my elementary years! I studied in a public elementary school. Yes...you read it right. I did...and I am proud of it. I'd rather not talk how I ended up in a public school a week after the start of classes, let us just say what caused it is something I always refer to as serendipity! Most people would always question capability of public schools as most of the time students their don't learn as much as students from the private schools. However it was not just true for my case. I had very good teachers and I was exposed to so many different activities, academic wise and even extra-curricular activities. Those things I'd say help me shaped the person I am today. I wish I had let the IT Guy scanned more photos...but anyway here are few snapshots of my young life! While I was busy as a bee in my extra-curricular activities I did not neglect my academics at all! I was representing the school in almost all contests it joined. 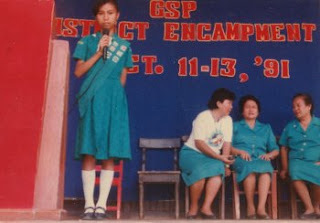 I was into Math Olympiad...Science Quiz Bee...and etc. I also did 2 investigatory projects for our Science fair which got us several awards! I think it's fair for me to say that somehow I did bring honor to my school...I've brought them home several trophies and medals. I did it because I have wonderful parents and teachers. I was a transferee when I was in grade one thought I moved in a week after the classes started. It was not an easy for me though. I finished the school year wondering how come I did not get any award when I knew I did well. I know my Mom did complain...but it was over for me. I graduated as the class valedictorian...and got a scholarship! Below is my Mom and the guy from the Scholarship Foundation. 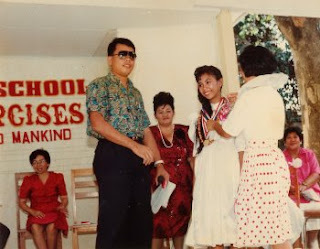 My parents were taking their turns in climbing up the stage because I had several medals then...I was not able to scan a photo with my Dad. 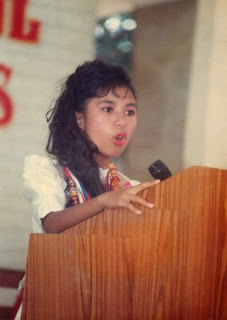 I delivered my very fist speech in front of over a thousand people at the age of 12. It was my valedictory address. Though I can't recall the exact words in my speech I have them in my heart and I live by it everyday. Good grades just as other things in life are something you have to achieve, not something that is free to receive. What an amazing story, you are an inspiration for all women to do well.Congrats you worked hard and earned every honor.